A gourmet entree of salmon served up on a heated rock with some gourmet rice and a mixture of fresh vegetables. A glass of cold white wine is the perfect beverage to accompany this meal. Cooking on a hot rock is a very unique way to prepare a meal and has been used for centuries by a mix of cultures. The food is sensational at the Rifflin'Hitch Lodge in Southern Labrador and the guests are treated and fed like kings and queens. Salmon served sizzling on a highly heated rock, Chef Nancy Elliot, Rifflin'Hitch Lodge, Eagle River, Southern Labrador, Labrador, Newfoundland Labrador, Canada. 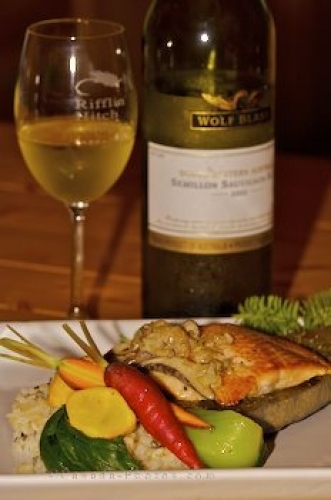 Picture of an entree of sizzling salmon accompanied by a glass of white wine.